A disappointing start from a promising company. Rebel Desk's first-generation treadmill is cheap, but severely lacking in several key areas. Worryingly lax packaging is also a concern. Two days of testing ended in mechanical failure, earning the product a single star. We're looking forward to Rebel Desk's next generation, but cannot recommend the Rebel Treadmill 1000 in it's current condition. 2 years for motor, 1 year for parts, labor, electronics, 20 years for the frame. Revised down to 250 lbs. It's very lightweight, so the company positions it as a "portable" treadmill. The Rebel 1000 treadmill truly is "lightweight" in every sense of the word. Thin steel and corner-cutting componentry, designed to be cheap to produce and ship, but not designed to last. As of now, we cannot recommend the Rebel Treadmill 1000. Two days of lab testing left us with a severely malfunctioning unit. We like the company, and we like some of their design choices, but their first go at a walking treadmill has come up very short. In this review update two years after our first test of the product, nothing has changed to improve the quality of the product. Unfortunately we have to give the Rebel 1000 our lowest rating – 1 star – with the hopes that they return someday with a more robust and reliable machine to test. We didn’t even get to start real stress testing on this unit before it had a catastrophic failure. The founders of the company are smart, motivated, and quite frankly very charming people, with a talent for internet marketing. But they lack the engineering and manufacturing expertise that one expects to find at the top of an organization that produces treadmill desk equipment. Most all treadmills are built in Taiwan or China these days, along with our TV sets and so many other electronic devices and appliances. Even the LifeSpan TR1200 and TR5000 are manufactured in Taiwan. But to rely solely on a Southeast Asian manufacturer’s design team to determine your component and packaging choices, without having an experienced engineering team stateside, is a very big risk to take. The rush to get this product to market in time for the 2013 holiday shopping season drove Rebel Desk to stumble out of the gate with an insufficiently tested product, and unfortunately, in the two years that have transpired since our first review, they've made no changes to the product other than to arbitrarily lower its weight rating to 250 lbs. In our opinion the $699 Rebel 1000 would need a complete design review iteration if it is to effectively compete against much better units (will we see a Rebel 2000 design in the future?). At the moment, presuming we did actually have a "lemon" to work with, the Rebel 1000 seems to compete more effectively against units like the TreadDesk and Exerpeutic WorkFit - which also received 1-star ratings from our expert review staff. When a LifeSpan TR800 costs only $799 the value contrast seems pretty stark to us. The Rebel 1000 (center), flanked by its main competitors - the LifeSpan TR800 (left) and industry-leading TR1200 (right). Rebel Desk is a fresh new startup from Washington, DC founded by the husband-and-wife team of Kathleen and Jeff Hale. Getting to finally test the actual product has been an eye-opening experience. We got to see how the Rebel 1000 treadmill base performs and how it is constructed in comparison to its main competitors, the Lifespan TR800 and TR1200 models, as well as all the other standalone treadmill desk bases on the market. The Rebel treadmill is targeted at the frugal customer who is looking for the lowest cost, smallest footprint solutions. The rub is that achieving a lower retail price point as a new, low-volume producer requires leaving out some essential features and reducing component quality in order to sustain a reasonable profit margin. Compared to a lot of other treadmills on the market, the Rebel Treadmill sports a slim, compact, metallic-silver appearance. It is slightly narrower, shorter, and lower to the ground than the smallest LifeSpan unit, the TR800. Before digging deeper we were impressed with the engineering effort it must have taken to reduce the weight of a treadmill so dramatically. The Rebel treadmill is remarkably lightweight at only 88 lbs., compared to 120 lbs. for the TR800, 131 lbs. for the TR1200, and 145 and 147 lbs. for the TR5000 and iMovR ThermoTread GT, respectively. However, being the lightest product in a field of competitors is a positive in the electric car or cell phone category, it's quite the opposite in the treadmill category. In this case, "lightweight" is an apt term, in more ways that one. The Rebel 1000 uses a lightweight frame, motor and other key components in the name of lowering production costs and shipping expense, making it suitable only for very lightweight users, indeed. Ironically, spinning its biggest negative into a positive, the company's most recent marketing campaign positions the Rebel 1000 as the first "portable treadmill." Ahem. Considering that the most common reason people get a treadmill desk is to alleviate their low back pain from too much sitting, the last thing anyone should be recommending to these users is that they bend down to lift and move a treadmill on a regular basis. But back to positives... starting up the unit is simple, with no annoying beeps, and a very gradual ramp up to the selected speed – a much more gradual acceleration than any other treadmill we’ve tested. At first this seemed odd to us, but once you get used to it it’s actually pretty nice. The downside is that it’s just as slow to stop, which we found annoying unless we were immediately stepping off the treadmill: Transitioning from walking to standing will force most people to stand on the landing strips until the belt finally comes to a complete stop. Clearly one of the things you lose in using a lightweight motor is torque at low speeds, hence the slow ramp-up of the walking belt speed is somewhat inherent to the design. Again, an apparent positive that's really just a marketing spin on a technical weakness. Rebel's control console (foreground) is smaller, and lacks a couple non-essential functions found in the Lifespan controller (rear). The control console is also bit of a mixed bag. In keeping with Rebel Desk's no-frills theme, the console is small and bare. Like the LifeSpan models, it sports an unsightly gym aesthetic—membrane keys and all—that looks and feels foreign at the office. It's smaller and less obtrusive than other controllers, but lacks anything more than just the very basic functions. It certainly doesn't have the iMovR ThermoTread's touch-screen, color LCD desktop console with its popular features such as tracking sit/stand/walk time, pomodoro timer, "click-wrap" liability waiver and multiple user profiles. This unit is for lightweight home applications only, and wouldn't pass muster with most legal departments as a unit to bring on the corporate campus. On the good side, the documentation is well-written, short and sweet. There is only one error code – ‘E1’ –and no “Engineering Mode” to customize settings on this no-frills rig. We applaud Rebel’s decision to include the pacing regimen developed by WorkWhileWalking right in their manual to help users get a good experience out of the gate. The noise signature of the unit is comparable to the LifeSpan units, but significantly louder than the ThermoTread GT's 42.7 dB, coming in at 57 decibels down by the deck. It's quiet enough not to be noticed during phone calls, but more likely to be annoying to workers in nearby cubicles. Keep in mind that decibel readings are on an exponential scale, so a 14 dB difference makes the Rebel treadmill several times louder than the iMovR unit. We’re used to walking on the LifeSpan and iMovR treadmills in our offices every day, and have developed a certain intuition about how one should feel. So the first thing we noticed when stepping onto the Rebel 1000 was a significant increase in flexion in the deck and frame as compared to the more ruggedly-built treadmill bases. A contributing factor was the fact that the adjustable feet on the unit arrived set so high that the back of the unit was resting on the caster wheels instead of the feet. Once we leveled all the corners we tested the unit again for flexion, and while less than we initially experienced, the flexion was still noticeably greater than one would expect from a quality treadmill. The pronounced deck flexion was disconcerting to some of the test subjects, while others didn’t find it noticeable, but it does lead to some concern about the durability of the laminated deck. Too much flexion can lead to early degradation of the smooth surface of the deck, increasing friction and power consumption. During our tests, the Rebel was dramatically less rigid than other treadmills, and the frame so weak that we could see the landing strip rails wiggle up and down with every step, even with users as light as 160 lbs. This, despite its "300 lb." weight rating (which later turned out to be a very optimistic rating conjured up by the marketing department, not the engineering department). 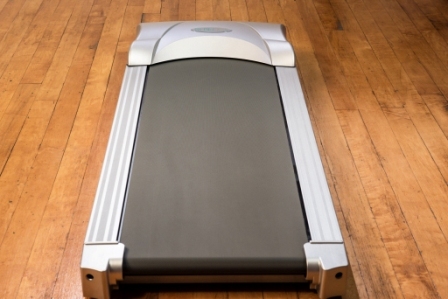 Ironically, the Rebel should have been the most rigid, given not only the fact that its deck length is the shortest, but also their touted use of eight “elastomers” (fancy word for the cushioned mounting points where the deck attaches to the frame) versus the standard six found on most every other treadmill desk walking platform. The degree of deck flexion was not a good sign; it was time to take the motor housings off the units and get a look at the frame structure and componentry for an apples-to-apples comparison. Note the super-strong rectangular steel tubing used around the entire frame of the TR800 frame (left) compared to the smaller frame members and entire sections of the Rebel 1000's frame that are made of just plain sheet metal. We had wondered all along how Rebel was able to come in 32 pounds lighter than the featherweight TR800 without losing too much of a treadmill’s necessary skeletal structure and components. Once we popped the hood off it was clear that the frame was very cheaply built. Our expert review team members' consensus upon seeing the exposed Rebel frame was that a scant amount of metal was used for an appliance that ostensibly needs to withstand heavy g-forces in its daily use. Rebel wanted a lower profile, too, which they achieved in dropping the walking deck by another ¾” below LifeSpan’s deck height - once the lowest-profile walking treadmill deck at slightly over 5” above ground. Rebel’s designers also reduced the diameter of the rollers (over which the treadmill belt is fitted) significantly. This is generally shunned in high quality designs because it forces the motor to spin faster (wearing down the commutator brushes sooner), the drive belt to stretch and wear out faster, the walking belt to wear down faster because it has to make a tighter turn around the roller, and the belt to slip more easily because there is less gripping area on the rollers. The remedy for having less grip area with these smaller rollers is to increase the tension on the walking belt, which increases friction, power consumption and wear on all the components. There are cost benefits to using smaller rollers on the other hand, in that the resulting higher drive ratio increases the torque/force delivered to the rollers at a lower manufacturing cost. In the end, though, lower manufacturing cost translates to lower reliability. The treadmill's motor controller board, though made by the same manufacturer as the one LifeSpan uses in the TR800, is smaller in the Rebel. The Turdan motor is also the same make as LifeSpan uses, only a 1.5 hp version, rather than the 2.0 hp or 2.25 hp units used in the TR800 and TR1200, respectively. In terms of current draw, however, the Rebel, the TR800 and TR1200 all come in within a few percentage points of each other, which is a much more important performance indicator than the relatively meaningless horsepower rating that manufacturers like to boast in their specs. The Rebel's downsized motor and rollers compensate by running at higher RPMs, resulting in a power draw equivalent to the LifeSpan TR800 and T1200 bases, but with a hit to reliability. Once we had the cover off we could quickly surmise that the entire Rebel unit is spray painted. Rather than make the plastic parts with the right color dye they chose to use thin, cheaply made plastic housing and rail parts and spray paint them with an attractive metallic silver sheen. While the paint looks great in photos we found that it scratched off and scuffed very easily. When we put the thin-shell motor housing back into place one corner of the hood cracked when the last screw was driven in under normal screwdriver force, a few inches away. The cable that runs to the display console comes out of a hole on the side of the unit, with no rubber grommet to hold it securely in place, if pulled. This explained the warning we read the in the Rebel’s owner’s manual to not pull on this cord. And, like the owner’s manual says, we would definitely advise against carrying the Rebel by its supply cord. The walking belt itself cups unevenly along the edges, which produces odd scraping sounds and exacerbates the appearance of deck and frame flexing. The belt is otherwise the same quality as the one used in the TR800, and, also like the TR800’s, lacks any markings so you that can clearly tell when the belt is in motion – an important safety feature we like about the TR1200, TR5000 and iMovR treadmill bases. Another missing feature of the Rebel 1000 is that it doesn’t automatically stop the motor when you step away from it. Higher quality treadmill bases have this built-in feature (what Lifespan Fitness calls "IntelliGuard"), which saves energy and prevents trip-ups. After about 20 minutes the Rebel 1000 does stop automatically, but the machine goes into ‘E1’ mode, and you have to literally turn the power off and back on again to reset the unit before starting it again. We don’t know if this was an intended software decision or something related to the general motor/controller failures we experienced later (read on), but we were very surprised by it. When the unit first arrived, it came in a cool looking, but woefully thin cardboard box labeled with Rebel Desk’s slogan “Your chair just got really nervous” in big bold print. The box was damaged pretty badly. When we opened it up we learned why. A LifeSpan or iMovR treadmill base arrives in a thick carton nestled securely in custom-molded, paired halves of dense Styrofoam, and resting atop a custom-sized forklift pallet. The Rebel unit arrived with a few irregularly shaped pieces of Styrofoam loosely packed around it to hold the treadmill in place in the center of the box, with the whole mess taped together with miles of packing tape. No pallet. It looked as if someone had just taken random pieces of Styrofoam out of a discard pile and shoved them in around the unit. After removing the treadmill we found hundreds of little broken Styrofoam bits on the bottom of the box. The Rebel unit had plenty of room to bounce around inside the box, and the paint job on the landing strip rails was already a little scuffed up from the trip. The lubricant bottle that comes with the unit had spilled open, but was thankfully contained inside a plastic baggie. We reported this to the company and they said they were disappointed with their vendor’s packing as well, and were working on improving it. 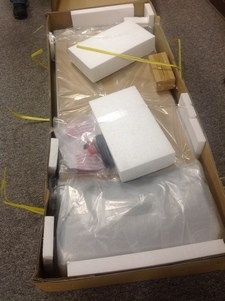 A search through feedback from verified buyers on Amazon revealed that other users had similar experiences with the packaging, for example this one who noted: "Things break in shipping, it it part of life as someone who buys any products on the Internet, one thing that isn't part of life is products that break in shipping because they are packed like they are going to be gently carried out to the car. 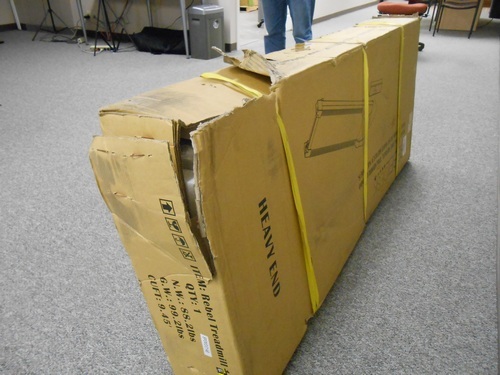 My treadmill didn't arrive broken because of poor handling by anyone, it arrived broken because the packing was so shoddily done, seriously pathetic, that it was probably placed on the ground or truck firmly or something over the load max was on top of it. If a company doesn't take pride in their product and wants to make a positive first impression, they honestly don't care much. Getting this giant box out of my living room and buying elsewhere." Another user noted "I did have quite a few problems with the delivery. I had read the reviews here on Amazon and noticed that several people had received damaged treadmills resulting from poor packing. I discussed this with Rebel and was assured that they had solved the packing problems. So I went ahead and placed my order, with a delivery date 3-4 days away. Well, at 5 days the treadmill had not even been shipped. After that I had to stay on top of the delivery issues constantly, and even so, the treadmill took two weeks to arrive. And when it did arrive, guess what, it was in the old bad packaging and had a big smash in it. So after all that, it had to be returned. And the delivery guy was pretty mad, given that he had to carry this heavy thing upstairs and downstairs twice." The thing about these two comments? They were both posted more than a year after our initial review of the Rebel 1000, so it seems that whatever Rebel Desk thinks it has done to improve its packaging is not working. After only several hours of trial use by our review staffers – who weighed 160, 200, 220 and 300 lbs. – the motor suddenly stopped 20 minutes into the first session with the 300 lb. user. Once the treadmill was restarted, we noticed a loud creaking sound coming from the deck on every stride. From that point forward the motor failed every 5 to 10 minutes, regardless of which user was walking on it. It’s possible that either one of the elastomers holding the deck up or the deck itself – a critical component of any treadmill – had developed a crack, and the extra friction that resulted may have been causing the motor to fail after only minutes of use. We, unfortunately, could not proceed with our testing process at this point and re-packed the treadmill to send it back to Rebel for failure analysis. They never got back to us with the analysis. After we reported this event, Rebel Desk immediately revised the weight rating published on their website to 250 lbs, but like the original published rating, we suspect this new weight rating is based on a marketing decision, and not actual testing. We've often noted that there is no industry standard for treadmill weight ratings, and some, like Exerpeutic and TreadDesk, are notorious for overstating their ratings. On the other hand, professionally-engineered units like the iMovR ThermoTread are designed using FEA software (finite element analysis - like aircraft manufacturers use to simulate stresses before prototypes are built) and are then tested on automated test rigs that simulate years of actual use, to confirm that the design meets the marketing specifications. We had high hopes for this new entrant into the walking treadmill marketplace, but in our opinion – having tested many treadmills over the years – Rebel Desk needs to go back to the drawing board and re-evaluate its frame design, motor mount and deck material. It's fairly clear to the treadmill design experts on this review team that a few corners were cut a bit too tightly in the name of cost and size reduction. We're inclined to believe that some consumers may like the compact size and aesthetic styling of the Rebel, but $150 is all it takes to upgrade from the Rebel to a far more reliable platform with the LifeSpan TR800. Generally speaking, however, every treadmill priced under $1,000 that we've ever tested (e.g. the TR800, TreadDesk and Exerpeutic WorkFit) has been found lacking for the things a serious treadmill desk user would require, and you have to get into the $1,500 price level before you can be sure that the unit you buy is truly going to run reliably for many years. 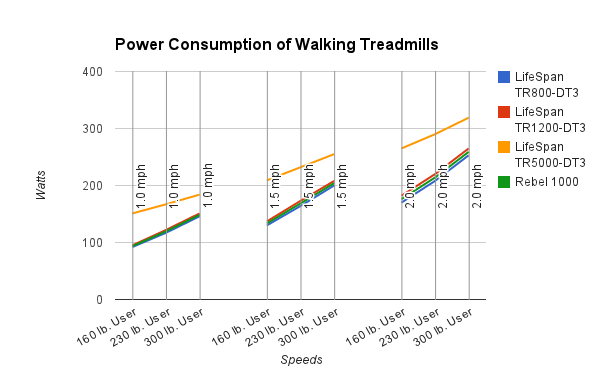 This is because walking on a treadmill puts much more strain on a motor, deck and frame than running on it. This may seem counter-intuitive, but the physics of pulling a dead weight while overcoming the friction between the deck and belt are just much more demanding than a runner who is using the treadmill at a higher speed, where the motors have higher torque, and they're actually kicking the belt back instead of standing on it with all their weight. This is primary reason that a good office treadmill base is going to have a much stronger motor and different gearing ratios than a running treadmill - to produce high torque at low speeds. We don't ordinarily allow vendors to comment on our reviews prior to publishing but this was clearly a special case and in good faith we wanted to give the Hales an opportunity to respond to our findings. Their first response was to assert that we must have received a "lemon," and they offered to send us a new one in a couple of weeks, as soon as their new custom styrofoam packaging was ready. They planned to include their new matching Rebel Desk product as well so that we could review the entire workstation setup. This offer was retracted a day later, however. Rebel maintains that the majority of users don't weigh 300 lbs. and that they had made smart choices in trading off some expensive components and features that wouldn't make much difference to most users. In general we concur with this supposition, however we can't dismiss the very simple fact that the unit failed under normal use conditions, like no treadmill ever has in our testing lab. Two years have passed since we first reviewed the Rebel Desk 1000 Treadmill, and as far as we can tell the unit has not been enhanced in any way. Rebel continues to be a small niche player, offering a bargain basement product for the person on such a tight budget that they'd rather risk having to upgrade to a better treadmill in the future when this one dies on them. And that's a legitimate market. A lot of people think to themselves that they don't know whether they're really stick to treadmill desking after they do it for a while - and that the unit may end up in the attic next to that elliptical they bought and used for a month or two - so we can understand the cautionary approach. But what we know from talking will literally thousands of treadmill desk users over the years is that more than 99%, once trying it out, stay with it as they new workstyle. So you're better off spending a little more and getting something that was designed to last. If you’re not already a subscriber to WorkWhileWalking’s newsletter register now to stay abreast of Rebel Desk’s progress as well as all the other new products we review each month. If you’re thinking of buying or selling a used treadmill desk, be sure to check out our primer on used treadmill desks, and especially the conquest bonuses offered by some manufacturers to switch to their brand. RebelDesk offers a 1-year parts warranty and a 2-year motor warranty (+ 100% money-back guarantee up to 30 days after receipt of the treadmill). Both are fairly standard; their 20-year frame coverage certainly looks impressive, but doesn't mean much. Most competitors, Lifespan and iMovR included, offer lifetime guarantees on their treadmill frames. It's worth mentioning iMovR's EcoLast TreadTop Standing Mat as a great add-on for the Rebel 1000, or any office treadmill, for that matter. When you want to take a pause from walking the last thing you want to do is stand on the cushion-less hard deck of a treadmill for very long, lest your feet start to suffer. These TreadTop mats are premium-quality, 100% polyurethane standing mats that are cut to size to specifically fit popular office treadmill models. They can be used atop the desk or astride the treadmill if you have a sit-stand-walk workstation, or both. Be sure to check out our 5-star review of the TreadTop Anti-Fatigue Mat. For the Rebel you'll want the 18" x 30" version that'll fit comfortably between the side rails. Way to go, guys! By selecting a size range of 160, 230 and 300 lbs, you effectively left the large majority of women users right out of the picture! A more reasonable range to test would have been 120, 200, 300 lbs. It’s truly amazing that women remain so invisible to every industry from manufacturing to reviewing. So far, great. Was looking for something small, only meant for office walking, that could fit under an existing standing desk. Company has been very responsive; good sense of humor (box said “You’re desk just got really nervous”. Product arrived promptly at the holidays. Was out of the box and running in under 15 minutes. It’s quiet, unobtrusive, small and sleek. I’m thrilled and will be watching like you to how it wears over time.